Black Inc. has announced it will publish a new triannual journal, Australian Foreign Affairs, which will include essays, interviews, reportage, book reviews and correspondence. Australian Foreign Affairs will be perfect bound and have the same format as the Quarterly Essay. It will be available to order through Penguin Random House and priced at $22.99. 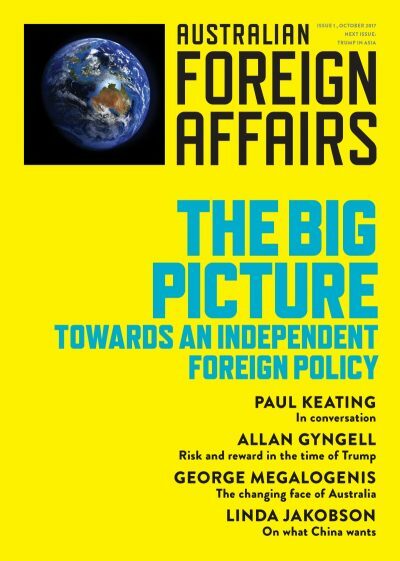 The first issue, The Big Picture: Towards an Independent Foreign Policy, will address ‘the most significant foreign affairs dynamics affecting Australia today, including the rise of China and the election of Donald Trump’. It will include contributions from Paul Keating, Allan Gyngell, George Megalogenis and Linda Jakobsen, and be published on 17 October. For more information, visit the Australian Foreign Affairs website here.